Peter L. Larson, paleontologist and geologist, is a paleontologist and the president of Black Hills Institute of Geological Research in Hill City, South Dakota. Larson is on the research team investigating Archaeopteryx and other fossils at the SLAC National Accelerator Laboratory. Today he blogs about the fossil Archaeopteryx and how high powered X-rays helps us learn new things about this unique fossil. Paleontologist. 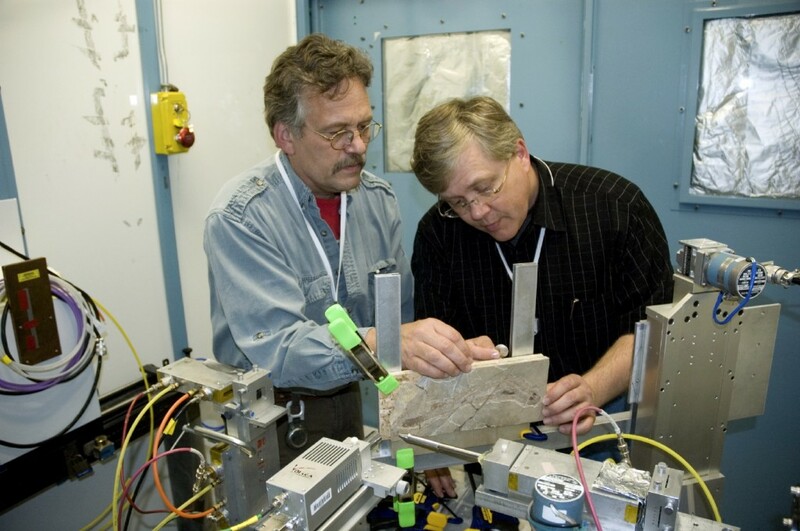 Pete Larson (left) at the SLAC National Accelerator Laboratory. The discovery, sale and subsequent scientific examination of the sole surviving thousand year old palimpsest recording the work of Archimedes (who died in 212 B.C.) has made it possible to study fossils using high energy x-rays to map the distribution of elements across the surface of the rocks containing their remains. A group of scientists gathered at the Stanford Synchrotron Laboratory in Menlo Park California to study one of the iconic “missing links” of evolutionary biology, Archaeopteryx. This investigation was able to show that not only was there original material from the living Archaeopteryx preserved in the dino-bird skeleton, but that the “feather impressions” were not impressions of feathers, but the feathers themselves, preserved in the limestone matrix for more than 145 million years. This research has opened a door to a new dimension for the study of fossils. It gives us a new way to study soft tissue, the chemistry of preservation, and details that everyone thought were lost in time. For details about the X-ray Fluorescence imaging of the Thermopolis specimen of Archaeopteryx, see the May 10, 2010 issue of the Proceedings of the National Academy of Sciences. Take a tour of our current Archaeopteryx: Icon of Evolution exhibit with Pete in the video below, and don’t miss your opportunity to ask him questions during our upcoming online webinar session. Join us on June 17 at 10 a.m. as Larson answers questions about Archaeopteryx, the exhibition and his own research. Register here, or see instructions below. Archaeopteryx: Tour the Exhibit with Pete Larson from HMNS on Vimeo.